Microsoft Office includes several programs, including Word, Excel and Outlook. Uninstalling only one of them is fairly easy using Office Setup. I have a new PC with Vista on it. I have installed MS Office 2003. I do not want to use Outlook. I'd rather use Windows mail which came on the PC. How do I uninstall just the Outlook program? When I go to add/remove programs I have to delete the whole MS Office edition. Actually it is a tad confusing, I agree. We tend to think of Outlook as a standalone program, and as such would expect to find it listed individually in Add/Remove. The problem is, from Office Setup's point of view, it's not a program. I'll be mixing Office 2007 and Office 2003 here, but the concepts apply to both. The short version is that Outlook is considered a "feature" of the larger Microsoft Office package. That means that in order to uninstall it, we'll Change the configuration of Office. "... Outlook is considered a 'feature' of the larger Microsoft Office package." Note that one of the options is to Change the installation. Click on that. At this point you'll see all the major components (or "features") of Microsoft Office listed, with checkboxes indicating which are currently installed. To remove one, simply clear its checkbox, and press Next. That should remove that component. I'll also leave you with this thought: consider not uninstalling it at all. Outlook in particular is benign - it doesn't do anything except take up some disk space unless you actually use it. In the grand scheme of things, it might be simpler to just let sleeping programs ... er, features ... lie. How should I setup Outlook? In this fifth in a series of articles covering my new computer's setup, we continue by making adjustments to Microsoft Outlook. 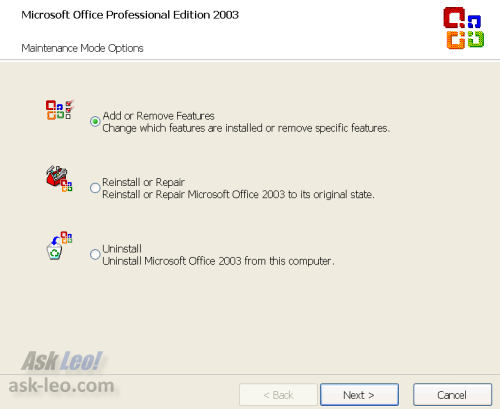 Is Office 2003 compatible with Widows Vista? Various issues are leading people to wonder if Office 2003 will work on Windows Vista. Yes, it will. We'll look at some of the possible problems. I am trying to put a synopsis on a website for criticism but nothing I do works. I have filled in the box for permitted websites but it always opens a new web page. It doesn't copy and paste and it doesn't drag and drop. I tried e-mail but every time Outlook comes up to tell me it's not working. I am desperate to get rid of it. All the microsoft programmes are difficult to use. I have removed all windows live because they're too complicated. Outlook is just a nuisance so I will try to remove it with the above instructions. Leo, I tend to agree with you on this subject, just leave Outlook alone! You don't have to make Outlook your 'default' email source. I have Outlook on my PC and have had for many, many years. I simply ignore it, let the Outlook icon stay were it wants to and go about my own business using Outlook Express, setting it has my 'default email source. Some things are better 'left alone' and Outlook is one of them. smtp is not recognized. It makes little difference but is disturbing at times. I have had my share of problems with Outlook. For some reason when my computer gets an update from Microsoft,outlook becomes my email for some reason. Therefore I need to go back to INTERNET explorer go to tolls and reset my windows XP back to Outlook Express. I do not know how to run Outlook. Has anyone have any Idea how to set this outlook express so that it stays there.Also were do I find the reply to this? Each to his own but, for the life of me, I can't think why anyone would want to delete Outlook. Even in my mid-sixties, I couldn't live without it. It is set to auto-start when I boot up on a Monday morning and is the only program which remains running 24/5 until I shut down on a Friday evening. I don't use outlook for the mail feature, however I use the contacts. It has a lot of blanks to fill. "Works" also seems to use the same contacts but it sorts them by the first name which is almost useless. I, too, prefer "Outlook Express" to "Outlook." I have used a program called "Time and Chaos" for a contact manager for years and it suits my purposes better than "Outlook." I hate the fact that MS insists on making "Outlook" the default mail service every time there's an update, but at least they give you a button to restore OE to the preferred program when you open it. I thought I'd removed "Outlook" from my computer, but will use Leo's method of killing it to see if I can finally put an end to that annoyance. I've got to like Outlook a lot over the years, from way back in the Office 97 days. I use it for personal and business email, for its Contact manager, for the Calendar, and I use Tasks to keep track of bills, etc. Good prog, IMO (and No, the cheque from Microsoft is NOT in the mail). Remove what Microsoft claims you can't. One warning; If you remove Outlook you may get an error message when starting up your computer/messenger about a missing file. You have two choices here - ignor it or download a copy of the file and copy it to your Windows\sytem32 folder. Can't remeber the name right of but it might eve be on your Windows CD. remember to unzip them first. For the life of me I cannot understand why anyone would not use Outlook. I in particular am not a good typist and using Outlook allows me to use Word as the means to write an E-Mail with the nicety of a good spellchecker and autocorrect for my many mistypes like ahve for have, etc. Also, if I want to save the E-Mail I just start it in Word, then hit the Icon to send a copy by E-Mail. Just so much more versatility than Outlook Express. MIKE, I think as long a you use IE to download updates from Microsoft then it will default to the Outlook at your preferred email program. Of course when I removed Outlook, Outlook Express become the default. DAVE, if you want Outlook Express, go download it at: http://www.microsoft.com/windows/oe/. At that site are some very helpful articles, including one one Outlook Express benefitting from re-registering too. I like Outlook (can't stand Notes). However, I am having a problem with folders. I deleted a folder incorrectly and now when I try to delete the folder from the Outlook directory, it gives me an error. Based upon what I ahve read, I have tried it all. Last was uninstall. However, when I re-install the folders are brought right back. Is there some hidden files or ini commands that I need to delete? 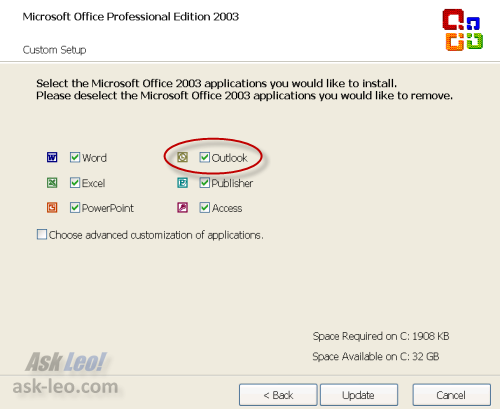 How do I delete Microsoft Office Outlook from my computer (have Windows XP)? It is on my startup sceen but I have never opened it but it constantly pops up on the screen while using the computer (10+ times per hour) and occasionaly I need help to make it disappear from the screen (am not computer smart, I'm satisfied that I can use the computer at all), VERY irritating. It appears on my startup screen as EMAIL but I use Yahoo, I prefer not to use M.O.O.. I'm not all that computer savvy. My son recently did a few things to my computer and added Outlook instead of Express (which I had been using). Didn't like it. I also lost all my folders and addresses. Seemed like a big hassle (to me!) to uninstall Outlook and reinstall Express. I just happened to try and read an old email saved in My Documents. Got a message saying Express was not my default email -did I want to make Express my default email. I clicked 'yes', and instant success! Got all my emails and folders back. So that saved me a lot of time and fiddling around. Worth a try. Can I uninstall Outlook and reinstall it? For 2 weeks now there have been pop up windows asking for password which are already in the program. Do I have to uninstall it? Will I have to change the registry or something like that (don't know much). Your help would be very much appreciated because I don't get all the e-mails I should receive. Yes, but first I would make sure you're entering the correct password and telling Outlook it's OK to save it. If that doesn't do it, then with your original installation media for Office available I'd first try a "repair" installation. If that doesn't work - backup, uninstall and reinstall. Locate and save your PST file - that has all the contacts in it. Then use a programn like Revo to completely remove Office, install a fresh copy, and then open the .PST file you saved. Outlook 2010 all of a sudden will not receive or send. Error message indicates POP3 and SMTP servers cannot be located and I should contact my ISP. ISP remoted in to Outlook in safe mode, tried a few changes, and still could not get it to work. They suggested I contact me security provider to check for a virus in Outlook or to see if there is something in security preventing Outlook from working. Security provider suggested I first uninstall Outlook and then reinstall. I originally downloaded Microsoft Office 2010, but I have a backup disk. Will I be able to just reinstall the Outlook 2010 portion? Also, will I need a product key if I have a disk ... There is no product key on the packaging. Thanks! use Belarc Advisor to record the product key before you uninstall it. I do believe you can uninstall and reinstall only Outlook. I agree with your ISP that looking at your security software is also in order - it can often interfere. Thanks for sharing this post.. you can also removing outlook through windows components wizard.. click -> start->select the Control Panel->double-click on the Add/Remove Programs icon->When the window pops up, click on the "Add/Remove Windows Components" icon at the right side of the window. The Windows Component Wizard will appear->Scroll down the list of components up to Outlook Express. Uncheck the box next to the icon and click Next->finally click finish .. once process has completed..
Can't email anything from Microsoft Word due to Outlook, which I don't have anymore. I have a 2002 version of Office XP and I put outlook.com in my address bar to check out the pros and cons and it automatically before I even had a chance to check it out. It is terrible. I tried to remove it following your instructions but when I open Office and click change, it will still not let me remove Outlook. Love the visual aids for folks like me! It's been a year on this "new" computer dealing with Outlook's insistence I use it, and not being able to get rid of it due to not understanding it being a "change" versus software. I was so afraid of deleting the whole package.